The Ramsar Convention on Wetlands is an international treaty for the conservation and sustainable use of wetlands, adopted in 1971 in the city of Ramsar in Iran. Together with UN Environment, Ramsar is supporting the development and implementation of SDG Target 6.6. Mangroves are of critical importance as breeding and nursery areas for birds, fish and shellfish and play an important role in the regulation of freshwater, nutrients and sediment inputs into the marine coastal waters. They provide coastal protection from storms and tsunamis and as more organic carbon is produced than degraded they constitute significant pools for carbon sequestration. 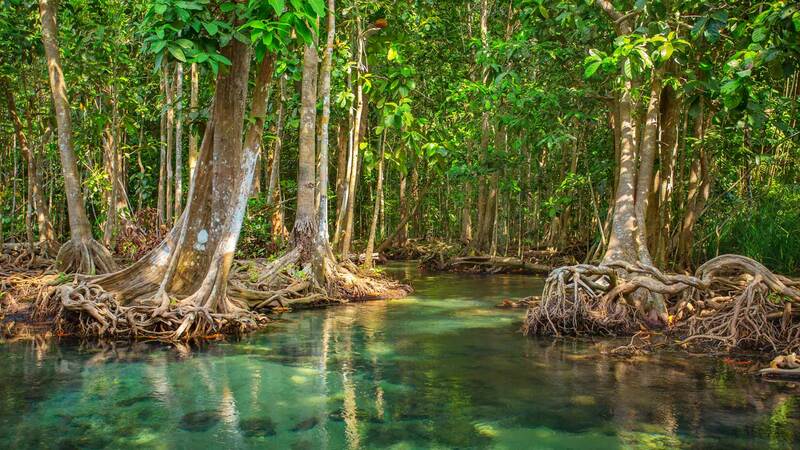 Within the UNFCCC REDD+ scheme, mangroves are categorised as forests and should therefore be included in national emissions reports. Once abundant along the world’s tropical and sub-tropical coastlines, mangroves are today in rapid decline worldwide. A large proportion has been lost or degraded by unsustainable exploitation practices, pollution and habitat destruction, in particular clearings for aquaculture, agriculture and industrial development. Mangroves are also sensitive to climate change induced effects such as sea level rise and changes in hydrology. Information on the state and change trends of mangroves at both national and global levels is furthermore limited, in part because mangroves often fall outside national forest definitions and therefore are not included in National Forest Inventories, and in part because of their often remote and inaccessible locations which make periodic mapping and monitoring of their entire extents by conventional means costly, if not impossible. Earth Observation on the other hand, by which large areas can be observed on a regular basis, is a tool which facilitates periodic monitoring. The Global Mangrove Watch (GMW) is an international collaborative project established within the framework of JAXA’s Kyoto & Carbon Initiative science programme, set up to provide fine resolution (25 m) geospatial information about mangrove extent and changes to Ramsar, national wetland practitioners and decision makers, and NGOs. The GMW is a Pilot Project to the Ramsar Global Wetlands Observation System (GWOS) that is implemented under the GEO-Wetlands Initiative. Key Earth Observation sensors for GMW are the (L-band) Synthetic Aperture Radar (SAR) satellite series operated by JAXA: JERS-1 SAR (1992-1998), ALOS PALSAR (2006-2011) and ALOS-2 PALSAR-2 (2014-present). The ability to penetrate clouds and haze combined with the sensitivity of the long-wavelength L-band signal to vegetation structure make these data particularly suitable for regular monitoring and change detection in cloud-prone coastal regions. The L-band SAR data are supplemented by Landsat-7/8 and RapidEye optical data and SRTM digital elevation data. The use of Sentinel-1 (C-band SAR) and Sentinel-2 data (optical) is also foreseen. (left) Mahakam delta, East Kalimantan. L-band SAR temporal composite. Red areas indicate mangrove loss. (R: JERS-1 SAR 1996; G & B: ALOS PALSAR 2010). © JAXA/METI (right) Corresponding mangrove change map, showing 2010 extent in green and changes between 1996 and 2010 in red (losses) and blue (gains) © Global Mangrove Watch, 2015. The JERS-1, ALOS and ALOS-2 data are assembled by JAXA into annual global 25 m resolution mosaic products which are available in the public domain (www.eorc.jaxa.jp/ALOS/en/palsar_fnf/fnf_index.htm). The mosaic products constitute geometrically and radiometrically corrected “Analysis-Ready Data” which are used within the GMW to create temporal radar data stacks from which mangrove extent and changes between the years in question are derived (Figure 7). Classification and image handling are undertaken by use of open source (RSGISLib.org) software. 1. Coastal masking and mangrove habitat location classification using SRTM, water mask (JRC 2016) and historical mangrove extent maps from around 2000 (USGS World Distribution of Mangroves and ITTO World Atlas of Mangroves). 2a. Mangrove extent classification of L-band SAR 25m mosaics under the coastal and habitat masks (mangrove/non-mangrove). 2b. Mangrove extent classification of L-band SAR mosaics from years X and Y (mangrove gain/mangrove loss) (Figure 8). 3. Validation (by in-situ data over 16 pilot sites and Landsat and RapidEye optical data). Earth observations provide a unique means to improve geospatial information on mangrove extent and changes over national to global scales. They can provide important support to the implementation of SDG Target 6.6, sustainable management of wetlands, national accounting for REDD+, disaster risk reduction, climate change mitigation, and law enforcement. All GMW satellite data, classification software and mangrove maps are free and open. Non-experienced users can use GMW maps as provided, Experienced users may replicate or improve classifications. Ramsar Convention and its Contracting Parties. Wetland users and NGOs worldwide.